In a large vessel, bring water to a boil. Add the broccoli florets & let it cook for about 5 min till the florets are tender. When this cools, blend/ puree the broccoli & the bolied potato. In a separate pan, prepare a thin white sauce. Melt the butter, blend in the flour, salt & pepper. Add milk gradually, stirring constantly, and cook until the mixture begins to boil. Add the broccoli-potato puree to this & heat to boiling, stirring constantly.Adjust the amount of milk depending upon the consistency desired. Season to taste. Garnish with croutons & serve hot. Thanks, Asha!I too love it. It's so healthy! You are always the first to comment :-). I am off to check ur soup now. I love brocholi soup. My favourite recipe is brocholi and blue cheese soup. Real comfort food! TBC i can't see the picture . will check back later! I have some broccoli at home. I should try this quick recipe. I am not a bog fan of broccoli in soups, but love yr foto! Creamy...crunchy ! Broccoli soup is new to me. Must try. that looks so comforting. what flour is it? I am bad at making soups and wanted to try this. Welcome to my blog. Hope to see you around here more often now! Poonam, welcome to my blog!It's nice to have you here! Do try it and let me know.It really IS yummy! It's your first time here! Thanks for visiting. Viji, thank you. Do let me know how it turns out. Seec, do give it a shot! Thanks for dropping by and for your kind words... ou have a lovely blog here... why dont you post the recipes for the dishes/pics that you posted earlier? would love to try out some of those...:) cheers and keep it going.. I love broccoli soup and this looks really good. TBC, I have tagged you for a MeMe. Do play it if you are interested and if you have time. Hi, first time at your blog. Nice blog with yummy recipes. Never heard about broccoli soup. Will try this.Thanks for sharing. AH!! Beautiful blend of flavours!! Creamy and crunchy at the same time! TBC, I have tagged you for a Random MeMe. Do it if you have time and interest. Soup looks thick and yummy. I will give this a try...since my little one likes soups. Thank you and a warm welcome to my blog!I will post the recipes when I get a chance/when I make them again.I started the blog initially just to take pics of the dishes I cooked, hence the first couple of posts only had pics. But now, pics will be accompanied by recipes too! Jyothi, welcome!Thanks for stopping by. Do try it & lemme know. Welcome to my blog!Hope to see you here whenever you can. Kajal, do try it out. It is really healthy too! 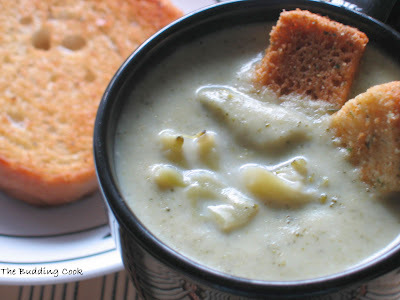 broccoli soups looks comfy and great post...thanks!